The library recently posted an EAP Professional position to the ISU hiring site for Permanent Art Collection Curator, a position that recently became part of the Special Collections Department. The posting is active and electronic applications are being received. We’d like to participate in the Thanksgiving Food Basket program for the Senior Programs Office of Western Indiana Community Action Agency. The Thanksgiving baskets will be given to the Foster Grandparent Volun teers who otherwise might not have a Thanksgiving meal. “The Foster Grandparent Program is a nonprofit composed of low-income seniors who spend their weekdays at local schools and daycares. They provide a positive influence on the children that they work with, oftentimes being rewarded with flowers by their classrooms as a “thank you” for doing such a good job. These are not just normal volunteers. These people want to be part of something bigger than themselves. They understand that some of these children do not have a role model at home, and these grandparents are there for them. One of the biggest rewards these volunteers receive is just being called “Grandma” and “Grandpa.” To someone who may not have grandchildren, this might just be the catalyst for them to keep helping out.” (from the donation letter). If you would like to participate, please let me know the item(s) from the following list, you would like to donate. Or, if you prefer, donate money to be used toward the purchase of items for the baskets. We thought we’d aim for 3 baskets. The baskets are to be delivered around November 20th, so please don’t bring in a turkey just yet. 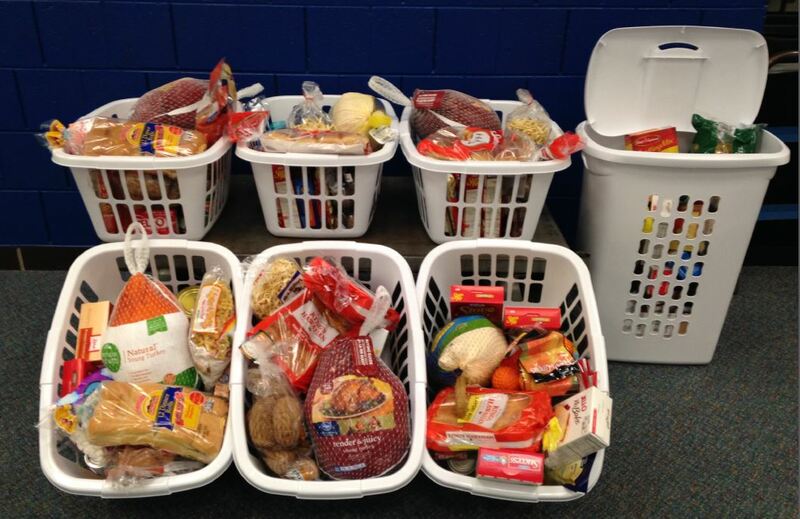 The Systems Department is issuing a challenge to the Admin Office, Public Services, Special Collections and Technical Services to each sponsor a Thanksgiving Basket for the Foster Grandparent’s program. 2) Collect items and/or money and someone in the department shop for the items not donated. 3) Opt out of the basket all together. Individuals in the department can still contribute by sending items/money to Dara, who will create a basket. Then time passed as each department went about gathering its items in its own way. Finally today, November 20, we saw the culmination of everyone’s efforts. The original goal of 3 was surpassed with a grand total of 7, and packed in re-usable laundry baskets. Thanks to Ginger Garvey for providing the transportation needed to get everything delivered in one trip and thanks to the departments: Public Services, Technical Services, Library Administrative Office, Systems, and Special Collections. Forks Over Knives is a 2011 American documentary film directed by American independent filmmaker, Lee Fulkerson, that advocates a low-fat whole-food, plant-based diet as a means of combating a number of diseases. There will be a panel of experts to answer questions after the movie and popcorn to munch on during the movie. 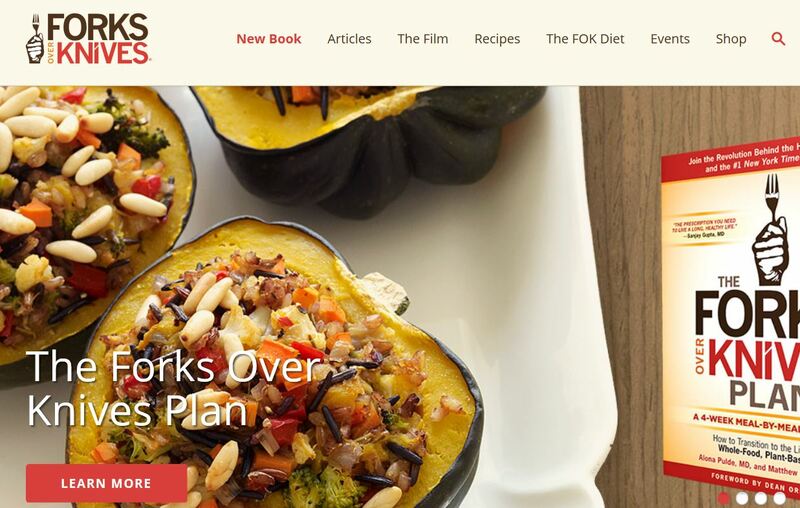 The official website for the documentary http://www.forksoverknives.com/ includes recipes and diet links, articles on wellness and success stories. Twenty-six years after emeritus professor Joseph S. Schick endowed the Department of English at Indiana State University with the most generous gift from a former faculty member, the Schick Lectures series is as strong as ever and has an enlightening program planned this year. In accordance with the endowment, the Schick series invites scholars from the United States and United Kingdom to lecture on literature and language topics before 1900. — Nov. 13: Cheryl Glenn, Pennsylvania State University: “Rhetoric, Writing, and Possibility.” Glenn is the author of “Landmark Essays on Rhetoric and Feminism: 1973-2000,” “Rhetorical Education in America,” “Unspoken: A Rhetoric of Silence, Silence and Listening as Rhetorical Arts,” “Rhetoric Retold: Regendering the Tradition from Antiquity through the Renaissance,” “Making Sense: A Real-World Rhetorical Reader” and other works. — Feb. 5: William Rossi, University of Oregon. Rossi is the editor of “Thoreau’s Walden, Civil Disobedience, and Other Writings,” “Wild Apples and Other Natural History Essays,” “Journal 6: 1853,” “Walden and Resistance to Civil Government,” “Journal 3: 1848-1851” and other works. — March 5: Ralph Hanna, University of Oxford. Hanna is the author of “London Literature, 1300-1380,” “Pursuing History: Middle English Manuscripts and Their Texts,” “William Langland” and other works. Schick taught at Indiana State, 1946-1976, and bequeathed $860,000 of his estate with his passing in 1988. The endowment is now valued at more than $1 million. With this lecture series, Schick continues to enrich young minds. Each lecturer spends at least a day on campus — and as many as three days in Terre Haute — so students get the opportunity to interact with these eminent academics from Oxford, Cambridge, Princeton, Brown and beyond. During a recent visit by Pulitzer-Prize winning Irish poet Paul Muldoon, a graduate student who was studying Muldoon sat next to him at dinner — and benefited from the interview of a lifetime, said Robert Perrin, English professor and department chair. Other students may meet a lecturer and then decide to conduct future graduate classwork at the lecturer’s university. The English department also buys a copy of the in-print books written or edited by each author, who autographs them during his or her visit. The collection, now up to 1,200 books, is kept in the Schick Library for use by students and faculty. This language club will have games created to assist in learning languages for attendees to play. The Japanese Culture Club will be showing Metropolis. (7:00 pm – 9:00 pm) in the Library Events Area. ISU graduate Jared Sexton will be visiting Indiana State as part of the Theodore Dreiser Visiting Writers Series. Mr. Sexton is an assistant professor at Georgia Southern University and the author of the short story collection An End to All Things. He will be giving a public reading of his work. Following, will be a reception and book signing will follow. This event is made possible with the assistance of Indiana State University Center for Community Engagement and the College of Arts and Sciences. 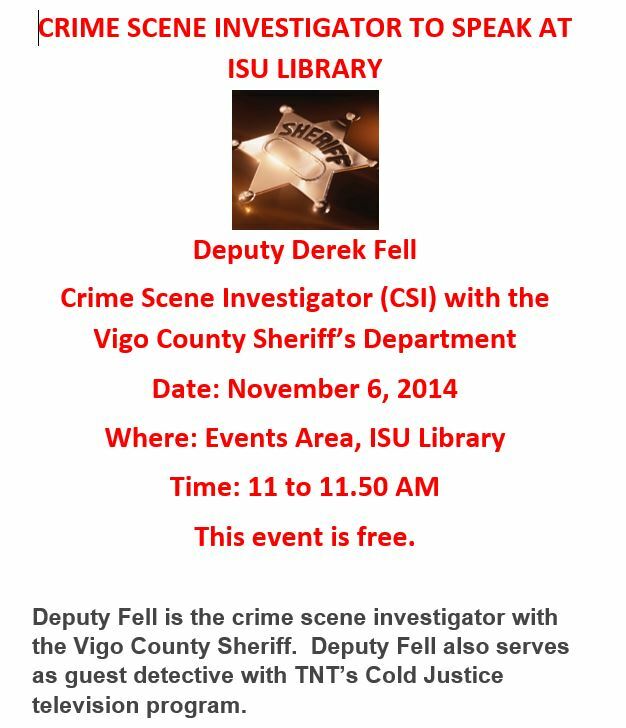 Deputy Derek Fell is the crime scene technician with the Vigo County Sheriff’s Office. He works with detectives as they work together to solve a wide range of cases. Deputy Fell recently accepted an offer from TNT’s “Cold Justice” and will serve as a guest detective. 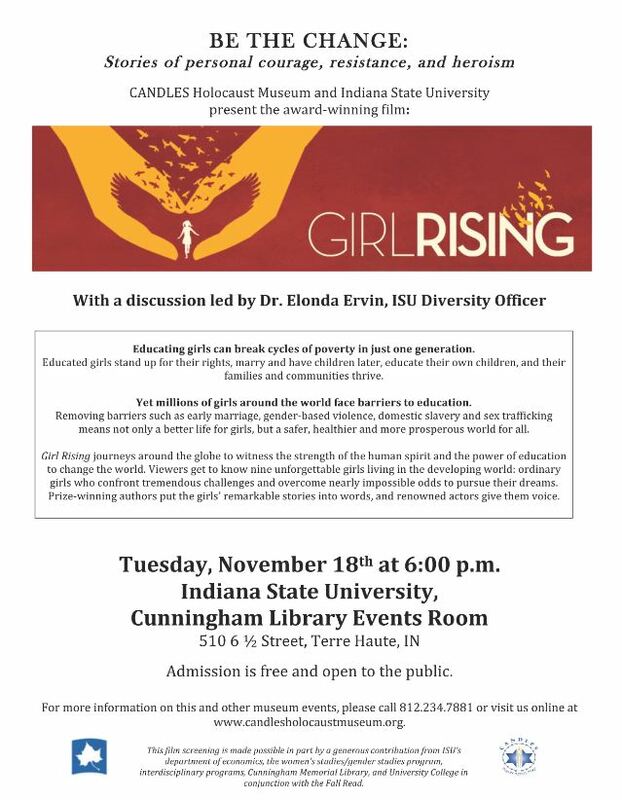 Girl Rising journeys around the globe to witness the strength of the human spirit and the power of education to change the world. Viewers get to know nine unforgettable girls living in the developing world: ordinary girls who confront tremendous challenges and overcome nearly impossible odds to pursue their dreams. Prize-­‐winning authors put the girls’ remarkable stories into words, and renowned actors give them voice. The movie will be added to the Library’s collection after the event.